Suppose you want to get away to a farm in the countryside, where you can stroll around the vegetable gardens or take a gander at the lambs. But suppose you don’t want to stay in a drafty old farmhouse, and instead of a day filled with barnyard chores, you prefer peace and pampering, with a solicitous staff to tote your bags, pour your afternoon tea, and offer you elaborate multicourse meals in a waterview dining room. 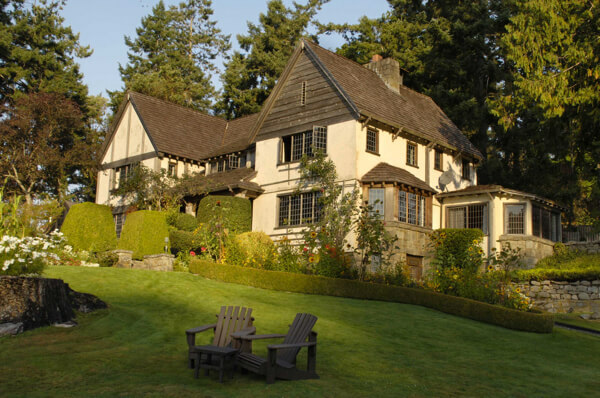 Though you’ll never stay here on a farmhand’s budget, you can indulge your fantasies of a deluxe country escape at the Hastings House Country House Hotel, on Salt Spring Island. For many years, this 22-acre property, on the waterfront a short stroll from the town of Ganges, was a working farm, and today, its vegetable plots and herb gardens provide some of the produce used in the posh Manor House Dining Room. 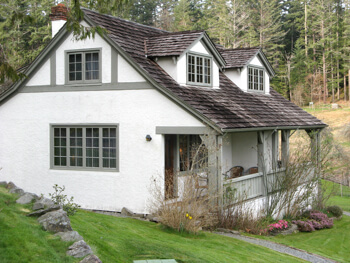 Many of the farm’s original buildings remain, including the Manor House (pictured above), which was built in the late 1930s to resemble a Tudor mansion on a British estate and now has two second-floor guest rooms, The Snug (a cozy little bar/games room), a lounge with a fireplace, and the restaurant. The former barn houses several suites, too, like the Hayloft (pictured at left). Hastings House still has a Farmhouse as well. Built in the early 1900s, it contains two of the property’s more lavish and spacious suites, with vistas across the water. In both, there’s a large living room and bathroom on the main floor, with a king-bedded room and a second bathroom upstairs. Frankly, I didn’t expect to love Hastings House. Oh, the setting is certainly lovely, with its manicured lawns and gardens right on the harbor. 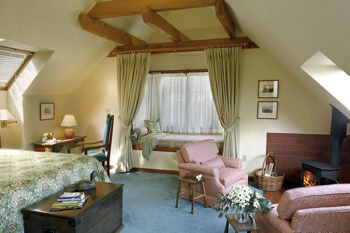 But the plaid and pine rooms are rather, well, twee — definitely more Laura Ashley than Philippe Starck. On down-to-earth Salt Spring, though, perhaps a post-modern boutique property would be out of place. After all, it’s an island where the highlight of the week’s social calendar is the Saturday Market, with its “Homespun Guarantee,” a pledge that vendors will make, bake, or grow all the products that they sell. And Hastings House won me over with two things: the excellent service and the fine, locally-sourced, contemporary food. Like elves, the staff deliver a fresh pot of coffee and muffins to your suite before breakfast, and they’ll pack you a picnic if you’re heading out exploring. Lest you be hungry before dinner, you’ll find cookies and tea in the lounge, and if you go fishing, the chef will cook up your catch for your evening meal. There’s a small spa where couples massage is popular, since many guests are here for a romantic escape or to celebrate a special occasion. If you fancy a stroll, wander the Sculpture Trail to explore the artwork placed around the grounds. Dinners, which are open to both guests and non-guests (by reservation), are served by candlelight, using regional ingredients whenever possible. The straightforward yet skillfully prepared dishes might include starters like seared tuna on an Asian slaw or a summer salad of ripe tomatoes and feta cheese and mains like Pacific halibut paired with stinging nettle pesto, or grilled pork tenderloin. You’ll have dessert, too — perhaps a caramelized walnut, hazelnut, and almond tart, a decadent dark chocolate and espresso mousse cake, or a bowl of fresh berries. So unless you’re an unrepentant hipster or an urban design geek, save your pennies for a Hastings House getaway. Your inner farmer — and your significant other — will thank you. 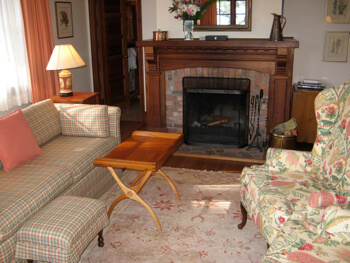 Room rates at Hastings House run between CAD$295 and $715 per night, including breakfast and afternoon tea, with most units in the $395-495 range. 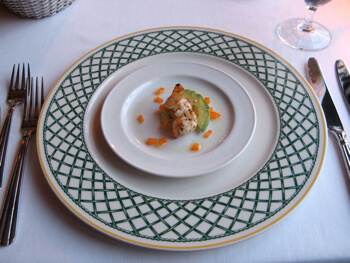 Dinners typically cost CAD$70 for three courses or $85 for four courses. BC Ferries can bring you to Salt Spring from Vancouver or Victoria; several small planes fly in from Seattle or Vancouver as well. 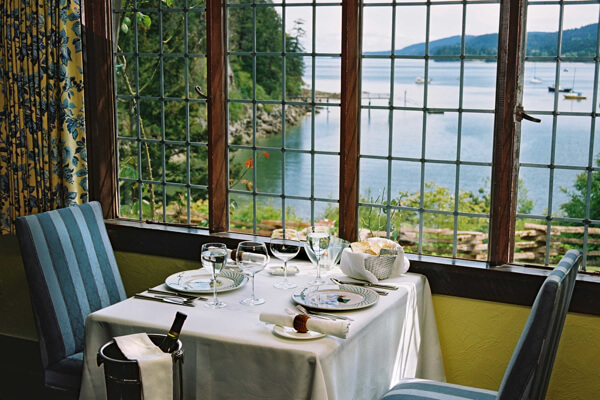 Hotel review by Vancouver-based travel, food, and feature writer Carolyn B. Heller, who also blogs about her culinary adventures at WanderFood. Manor House, Hayloft, and dining room photos courtesy of Hastings House. Farmhouse and dinner plate photos © Carolyn B. Heller. Hastings House hosted my stay for review purposes.